While technically the awards’ season hasn’t started yet, I believe that we have our first solid contender for the Best Picture nomination. You know how every year at least one more mainstream movie gets nominated? (For example, last year it was American Sniper, a year before that – Gravity.) 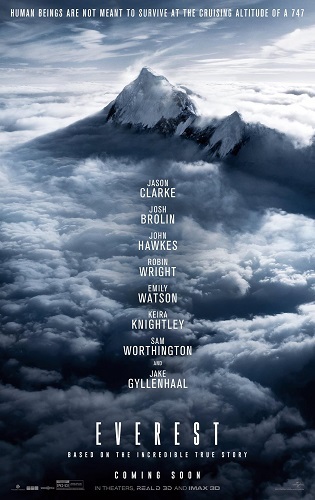 Well, I think that Everest will be this year’s awards nominated blockbuster. Let’s review it! IMDb summary: A climbing expedition on Mt. Everest is devastated by a severe snow storm. Everest film is based on the real events of 1996 Mount Everest disaster. I, personally, knew nothing about this tragic event, since I wasn’t even born when it happened. Also, while I knew that the movie was based on real life events, I didn’t want to research them much beforehand, so that I would not spoil anything for myself. However, I will spoil some stuff in this review, so if you haven’t seen the film and don’t know the real story like I didn’t know it, maybe come back to the review after you watch the film. If you know the story or just don’t care about the spoilers, please – read on. So, as with all Hollywood movies, one usually hopes for a happy ending. Well, it’s not the case with Everest. The most interesting part is the fact that until the very last minute, I was hoping for a happy ending. I was sure that we, as an audience, would get one. And only when the credits and the memorials came up, I’ve realized that this is not that type of a movie. Huge props to the creators of the film, who were able to keep the audience invested into the film till the very end. Also, they were able to break out of the Hollywood movie stereotype/pattern , which has a somewhat predictable ending and a plot filled with cliches. Not only does this film keep you invested till the very last minute, it affects your emotions a lot. While at the beginning of the film, you can find some inspirational stuff about following your dreams, at the end, you ultimately arrive at the conclusion that some dreams are not worth risking your life for. Or maybe they are for some people? That’s an open discussion. For me, the film was extremely sad, especially the 2nd part of it and the ending was heartbreaking. I don’t really cry in movies, but I was really tearing up in this one. Thank god, that I was the only person in the last row. This screenplay for the film was written by two British screenwriters – William Nicholson and Simon Beaufoy. Nicholson was a co-writer on Gladiator and has received an Oscar nomination for that film. He has also written a few of my favorite films – Les Miserables, Mandela: Long Walk to Freedom and Unbroken (co-writer). Beaufoy has an Oscar for writing a script for Slumdog Millionaire and he was also one of the writers on the second Hunger Games film – Catching Fire. I loved what they did with the Everest screenplay. The film had a lot of characters, but they all had their little moments to shine. As a result, this necessary character development allowed the viewers to feel connected to the characters and really care for them in the times of crisis. Also, the idea that companies like Adventure Consultants and Mountain Madness, who specialize in taking tourists to the summit of the Everest, really exist was a surprising one for me. I knew that were people who want to climb to the highest points of Earth, but I guess I never really expected somebody to allow them to do that for profit. Or that anyone would risk their life for such profit. But, I suppose if there are companies who would take tourists to space, you can’t expect people not to look for financial benefits down here on Earth. Also, as with every sport or occupation, there is a type of rush and desire to reach higher (literally, in their case), so I guess it shouldn’t be that shocking to me. The film was directed by Baltasar Kormákur from Iceland. I haven’t seen his other films, but I’ve adored the visuals of Everest. From what I saw in the behind the scenes videos, I can tell you that they filmed a lot of this film on location. And even if they used some green screen and CGI, you could never tell the difference – the film was seamlessly edited. In addition, the scenery of the mountain range was beautiful and terrifying and the same time. The actual climbing footage was suspenseful and exciting. This movie has a huge ensemble cast full of A-list actors and all of them bring their A-game. (A-listers and their A-game – sorry for the pun). I will only talk about a few of my favorite performances because this review would be way too long if I spoke about each and every character. Also, since in today’s world, you can’t review the movie without mentioning the color of the actors’ skin, I will just tell you that this film’s cast is predominately white. However, whitewashing is not the issue to the masses, because the film depicts real-life events which involved mainly white people. I’ve gotten extremely tired of people noticing the skin color of the actor before they notice the actual person, so, I hope you felt the sarcasm in a few sentences before this one. Let’s move on. Jason Clarke as Rob Hall was the leading man of the film, whose story was the most heartbreaking one. Until the very end of the film, I wanted to believe that he will make it home to his wife and unborn daughter. Keira Knightley played his wife – Jan Arnold – and their conversations on the phone were extremely emotional and one of the saddest parts of the film. Speaking of the actors performances, I have seen a few films starring Clarke, but he never really stood out to me until this film. For example, I thought that he was only okay in Dawn of the Planet of the Apes. However, I do believe his role as Rob Hall was his best performance to date and an amazing comeback after Terminator Genisys. Knightley was also amazing in her small part, but I was always a fan of hers, so that wasn’t surprising to me. Jake Gyllenhaal as Scott Fischer. Gyllenhaal just keeps impressing me more and more with his every film. His role was quite small here because the film had so many characters, but he was really good in it. I also applaud how versatile he is as an actor, not just with his body (Southpaw review), but with his overall mindset and investment into the character. While watching the film, you never really think about Gyllenhaal as an actor or about any other character that he has played before. You just sit there and marvel at a complete transformation of a true actor. Josh Brolin as Beck Weathers and John Hawkes as Doug Hansen. The reason that I’m putting these two people together is because I want to talk about the contrast that their characters brought to the film. Beck was a rich doctor, who climbed the mountain because he felt depressed at home with his wife, and Doug was a poor mailman, who did the climb to inspire kids from poor families. Beck’s reasons seemed much more selfish than Doug’s. The sad part is that Beck was the one who made it home and Doug didn’t. However, Dough reached the summit and Beck did not. So, their stories and the characters themselves, although contrasting at first, ended up being kinda equal. Beck’s reaction to the news of Doug’s death also added to that equality, because he seemed really upset by it. Speaking about the actors performance, I really enjoyed both of their portrayals of these real life climbers. I’m more familiar with Brolin’s work because he is Thanos in the MCU (very disappointing villain so far) and he also starred in Inherent Vice – the film that I have yet to watch but really want to. Brolin will also start in another movie this year, coming out very soon – Sicario – opposite Emily Blunt and Benicio del Toro (another MCU actor). On the other hand, I don’t know much about his co-star John Hawkes, but I really want to watch Winter’s Bone – a Jennifer Lawrence film which Hawkes also stars in. Sam Worthington as Guy Cotter, Emily Watson as Helen Wilton and Elizabeth Debicki as Dr. Caroline Mackenzie were the 3 main members of the base camp team. While they were not part of the action of the film, they reaction shots mimicked the audience’s reactions perfectly. To my mind, these actors really played well with each other and were a convincing group. About the actual actors, Debicki has only recently appeared on my radar after The Man from U.N.C.L.E. I really liked her there and felt the same in this film as well. She will also be in this year’s Macbeth with Michael Fassbender – another film which I definitely want to watch. Watson was also a great addition to the cast. I’m not really familiar with her work, but really loved one of her latest films – Testament of Youth, though, she only had a small part in there. Worthington (another Terminator) was also really good in his role. Avatar is still my favorite movie of his and I haven’t seen him do better than that film so far. However, I haven’t seen Cake – last year’s Jennifer Aniston film, which received quite a good word of mouth. True, all the praises were directed at Aniston for her performance, but maybe Worthington was quite good as well. I suppose I need to watch the film to really know. All in all, Everest is so far my favorite film of this fall and, in my opinion, a strong contender for the awards season. I hope that its release date (an early one) won’t be the thing that stops it from getting the recognition it deserves. The film is visually appealing to the eyes and emotionally captivating for the soul. Huge ensemble cast brings their A-game to the table, while the accomplished screenwriters and the director do justice to this heartbreaking real life disaster story. The music for Everst is on the hort list of possible awardees. It will be interesting to see which movies make the final cut for best feature film.